the turkey, mushroom and onion mixture, along with the rest of the ingredients in a large mixing bowl. Mix well with hands until everything is fully incorporated. Take loaf pan and fill with meatloaf mixture making sure it is firmly packed. Bake for 50 minutes, take out your meat loaf and top with organic unsweetened ketchup and BBQ mixture and cook for an additional 10 minutes. Top with bacon and place under broiler for 2 minutes. Let rest for 10 minutes before serving. Enjoy! First season your chicken breasts with sea salt, pepper, paprika, ginger, garlic and onion powder. Then bake breasts at 450 for 18 minutes. Next, starting with the onions sauté each vegetable in a large skillet with a tablespoon of avocado oil, season each vegetable with sea salt and pepper. Sauté until cooked and slightly browned, then transfer to a large pot that is off the heat. Once all vegetables are cooked added to your pot, place on a medium heat and add chili flake, hoisin, liquid aminos, vinegar, chili paste, hot sauce, and stevia. Stir until sauce is incorporated fully. Lastly add fresh herbs and serve. This dish is delicious without noodles! However kelp noodles with garlic and olive oil take it to a whole other level! This recipe is a must try! Enjoy! cauliflower and squeeze any excess water out by ringing out the towel. In a large bowl, mix together all ingredients until everything is combined and forms into ball. (Use your hands) Press your dough out onto a baking sheet lined with parchment paper. Don’t skip the parchment paper! Keep the dough about ⅓” thick and make the edges a little higher for the crust effect. Bake for 20 minutes at 400F. Then lower the oven to 300 and bake for additional 45 minutes. The crust should be golden brown and crispy when finished. Now is the time to add all your favorite pizza toppings: sauce, cheese, lean meats, and veggies!!! Go crazy! Return the pizza to the 400F oven, and bake an additional 5-10 minutes, just until the cheese is melted and bubbly. Slice and serve immediately! Enjoy! First preheat oven to 400F. Rub each potato with coconut oil salt and pepper. Then bake on a raised rack atop a cookie sheet for 50-60 minutes, until fully cooked but not mushy! Next, in a large glass bowl mix together turkey, mustard, Worcestershire, onion, garlic, egg, pepper, chili flakes, and sea salt until fully incorporated. Then portion out your mixture into 8 small patties. In a large skillet heat 2 teaspoons of avocado oil on medium high. Add 4 patties at a time cooking about 4 minutes each side until turkey is fully cooked, then repeat. It is important to only flip once so burgers stay intact and juicy. burger patty. Next layer lettuce, tomato, onion and one more slice of sweet potato! Now do your very best to get every layer in one big bite! Enjoy! This recipe is great for meal prepping. Store your patties and sweet potatoes in separate containers. To reheat, wrap whole burger in foil and cook at 425F for 15 minutes, add your toppings and dinner is ready! Preheat oven to 375F and line a cookie sheet with aluminum foil for easy clean up. First, heat a large sauté pan with coconut oil, once hot add onions and sauté for about 6-7 minutes. Then add mushrooms and cook for an additional 5 minutes, season with a pinch of sea salt and allow cooling off the heat. In a separate bowl combine turkey, and the rest of the ingredients. Combine using hands or a large spoon. Then add your onion and mushroom mixture to the bowl and combine until ingredients are evenly distributed. Next using a tablespoon, spoon large spoonful’s of the turkey mixture onto a cookie sheet 1-2 inches apart. (About 24 meatballs) Then take each spoonful and roll into a perfect round meatballs. This step makes shaping meatballs quick and easy! Bake in the preheated oven until no longer pink in the center and outside is browned, about 20 minutes. An instant-read thermometer inserted into the center should read at least 165F. Preheat oven to 400F and line a baking sheet with aluminum foil for easy clean up. spaghetti. Portion off the squash and serve with your favorite organic marinara and your homemade turkey meatballs! Enjoy! 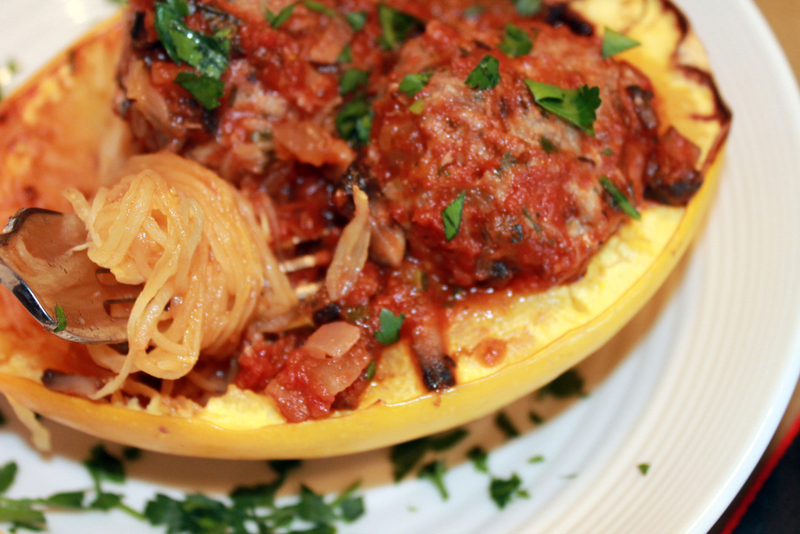 You can also use your spaghetti squash as your serving vessel just like a bowl. It is a fun and interactive dining experience for your guests! In a large bowl combine every ingredient, using a fork mix until incorporated. Next, form burger patties about 3 inches in diameter. Then heat a large skillet with one-tablespoon of coconut oil on medium high heat. Once oil is hot add 3-4 burgers at a time. Fry burgers for about 4 minutes on each side. Once a nice sear is reached on veggie burgers, remove from pan. Repeat cooking process for the remaining burgers. Finally, top burgers with your favorite healthy burger toppings. I like to top my veggie burgers with organic unsweetened ketchup, organic yellow mustard,lettuce, dill pickles, onions and tomatoes! Enjoy!